As most of you know, November is National Adoption Month. It’s the time each year when adoption organizations across the country celebrate with special events, programs, and activities to help raise awareness of adoption. For me, it has another special meaning: November is the month we were matched with our daughter’s birth mom. After two long years of waiting, we finally learned we were going to be parents! My life began to change on that fateful day — November 11, 2005 — and it is my hope that every person out there who longs to be a parent will soon get that call. Although I cannot make that happen, there is something I can do. I can use National Adoption Month to help educate and inspire those who are waiting to adopt. I can give you hope. First, I’d like to say that I’ve been where many of you are. I lost two babies to miscarriage and cried many tears before our daughter finally joined our family. But I’ve also been on the other side. I know what it feels like to become a parent after enduring so many heart-breaking struggles. And, I can tell you it’s amazing. All of your suffering really will be worth it in the end. So, even on your darkest days, please know that better days are ahead. Like me, you will get there one day. Keep the faith and never give up on your adoption journey. To celebrate National Adoption month and help those who are planning to adopt, I am sharing articles I wrote about adoption on my Facebook page. I’ve written some for Adoptimist, as well as other websites, and have covered a lot of topics. Some of them are inspirational stories about my own experiences; others contain helpful tips for navigating the adoption process. I hope you’ll take advantage of these great free resources and use them to help you in your journey to become a parent. Along with sharing these adoption materials, I am also spending the month of November reflecting and being thankful. Each day, I am writing down something I feel grateful for. The most obvious one, of course, is my precious daughter and the incredible opportunity I was given to be her mom. Even if you haven’t become a parent yet, this is still a good exercise. Try making a list of everything you feel thankful for. It helps you to keep a positive attitude, especially during the difficult adoption waiting period. And, since this month is also Thanksgiving in the U.S., it’s the perfect time to reflect on our blessings. Best of luck on your adoption journey. 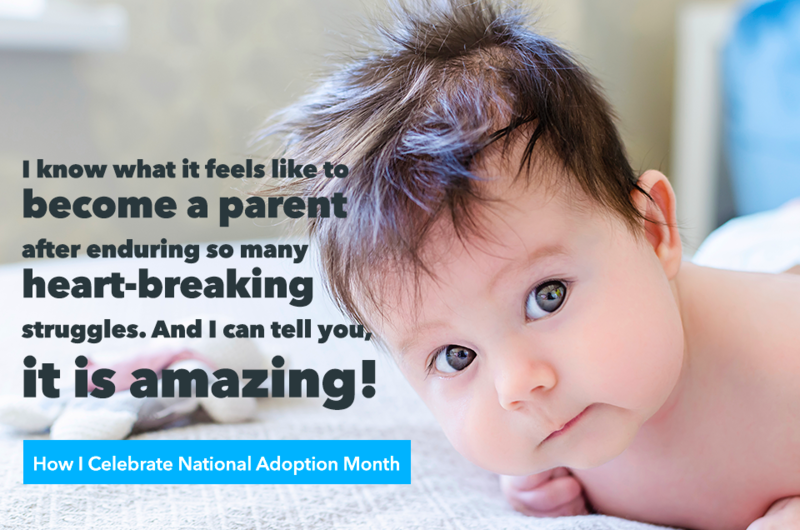 Happy National Adoption Month!